Rochester Gas & Electric No. 8 was built by General Electric in 1967 to promote its new line of modern heavy-duty industrial switchers. Our particular unit features narrow hoods on either side of the cab, part of Phase IV-B1 produced between May 1962 and September 1969. Originally constructed as a “demonstrator” unit that toured the country testing on various railroads, it was eventually assigned to the GE plant in Pittsfield, Mass. In 1988, it was acquired by the Berkshire Scenic Railway Museum in Lenox, Mass., where it ran in occasional excursion service. The unit received its sharp black, orange, and white paint scheme while at BSRM. Sold to Rochester Gas & Electric in 1991, the No. 8 worked at Russell Station in Charlotte until operations at that plant were phased out. 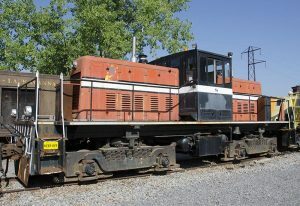 RG&E donated the locomotive, along with RG&E 1950, to our museum in 2008. All three locomotives owned by RG&E are now part of our museum collection. We used RG&E No. 8 for a few switching operations in 2008 before several issues were discovered including thin air reservoir tanks, worn air compressor valve seals, broken traction motor support bolts, worn traction motor brushes, and a loose traction motor brush holder. The locomotive was also very dirty and packed with coal dust throughout from its years working at Russell Station. We took the engine out of service to make repairs. Volunteers Ron Amberger and Joe Nugent replaced the valve seals in the locomotive’s air compressors in 2009. All traction motor brushes were removed at this time and new brushes were purchased. Additionally, all air valves were removed from the locomotive and sent out for rebuilding. New air reservoirs were purchased in 2010, thanks to grants from both the Amherst Railway Society and the NRHS. The air reservoirs were later installed and plumbed by Mike Walsh. Hand brake improvements were started in 2010 as well. They have yet to be completed. Our long-term goal is to restore the locomotive to its GE demonstrator colors.